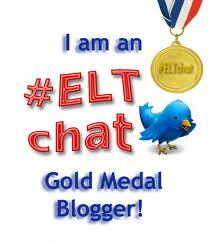 Congratulations for your gold #ELTchat Blogger medal! You have entered the pantheon of #ELT stars!!!! Thank you so much, Marisa, for #ELTchat, for keeping it going and being an inspiration.